Freshman Mitchell Chaffee tallied two points in the defeat to the Black Bears at Mullins. The Massachusetts hockey team could’ve used this weekend series with Maine as a jumping-off point but are instead searching for answers following a 3-2 defeat to the Black Bears Saturday night. UMass has now lost four straight games—the longest stretch of the season—and failed to gain any ground in the Hockey East Association standings on a weekend where points were up for grabs. Down 3-1 late in the third period, UMass (11-14-1, 5-10-1 Hockey East) came within one goal on a power play marker from freshman John Leonard. The Minutemen looked to have gained a renewed sense of urgency from Leonard’s goal, pressuring Maine (14-9-4, 8-6-3 HEA) in the final minute, but it all came for not as the Black Bears prevailed to earn the win and take four points out of a possible four in Amherst. 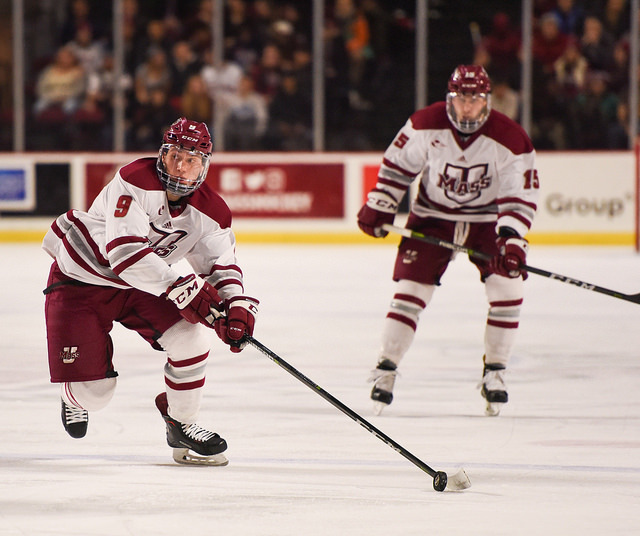 Chaffee scored UMass’ first goal at 14:45 of the first period after linemate Oliver Chau slithered into the Minutemen offensive zone and executed a spectacular backhand pass that found Chaffee weak side. The Rockford, Michigan native made no mistake to tie the game up for UMass at 1-1, while also registering his team-leading 10th goal of the season. The Minutemen outshot Maine 30-26, with nine of those coming on four power play opportunities, yet UMass couldn’t light the lamp when they needed it most at Mullins. Pearson scored his first of two just 18 seconds into regulation off an offensive zone faceoff on the Black Bears first shot of the game. Chaffee knotted it up, 1-1, 14 minutes later with a backhander that slipped under Maine goalie Jeremy Swayman’s (28 saves) pad. The Black Bears appeared to have regained the lead just minutes into the second period when Emil Westerlund beat Minutemen goalie Ryan Wischow (23 saves), however after review, it was deemed Wischow was interfered with and the goal was called back. Not to be forgotten, Westerlund made the most of another scoring opportunity, scoring on a dart from the hashmarks at 8:05, giving Maine the 2-1 lead. It wasn’t until the later stages of the middle frame when Pearson struck again after receiving a touch-pass from Mitchell Fossier and one-timed it into the back of the net, extending the Black Bear lead to 3-1. Leonard made it interesting with his seventh goal of the season, off an assist from Chaffee, but that’s all that would come about for UMass. “We got to learn from (these games). We’re a young team, we got to come back out here and learn from them this upcoming week, and we need to build from that and take it into next weekend,” said Chaffee.